Purpose : The purpose of this research is to answer the following questions : (1) When and how did PTA Mothers Book Club change its goal from the promotion of their own reading and writing activities to children's reading promotion?, (2) How did librarians and teachers perceive club members' positions and abilities?, and (3) How were they involved in the activities? Methods : First, we analyzed the records of the management board of the Club. Second, we examined essays written by a librarian who assisted the writing circle in the Club. 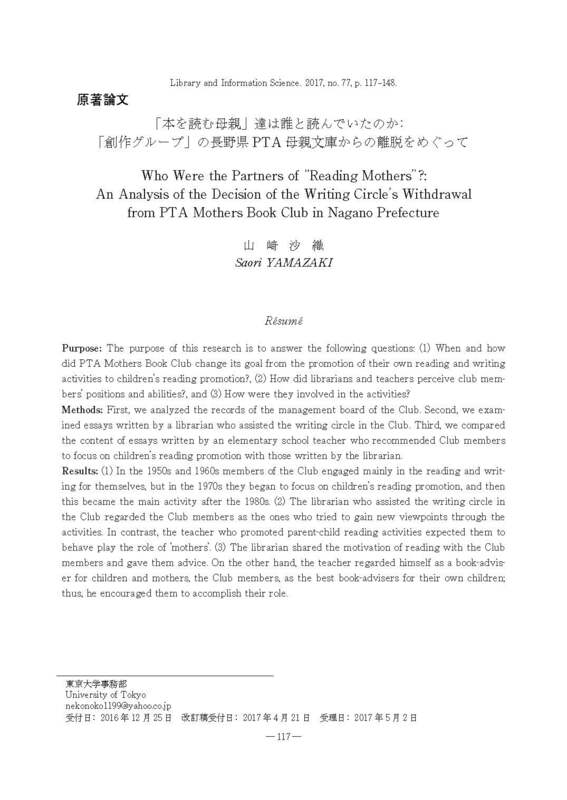 Third, we compared the content of essays written by an elementary school teacher who recommended Club members to focus on children's reading promotion with those written by the librarian. Results : (1) In the 1950s and 1960s members of the Club engaged mainly in the reading and writing for themselves, but in the 1970s they began to focus on children's reading promotion, and then this became the main activity after the 1980s. (2) The librarian who assisted the writing circle in the Club regarded the Club members as the ones who tried to gain new viewpoints through the activities. In contrast, the teacher who promoted parent-child reading activities expected them to behave play the role of 'mothers'. (3) The librarian shared the motivation of reading with the Club members and gave them advice. On the other hand, the teacher regarded himself as a book-adviser for children and mothers, the Club members, as the best book-advisers for their own children ; thus, he encouraged them to accomplish their role.